Mass of Christian Burial for Theresa Kay Martinez, 53, Lawrence, will be at 10 a.m. Tuesday at St. John’s Catholic Church. Burial will follow at Mount Calvary Cemetery. Mrs. Martinez died Wednesday, Jan. 19, 2011, at her home. 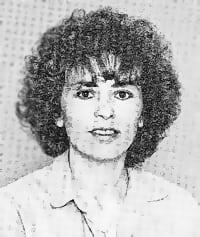 She was born Nov. 22, 1957, at Anadarko, Okla., the daughter of Marion and Elizabeth Charlotte Zane Ogle. She graduated from Riverside Indian School in Anadarko and then attended Central State University in Oklahoma. She worked as secretary to the president’s office at Haskell Indian Nations University and more recently was a stay-at-home mother. She was a member of St. John’s Catholic Church and a member of the Kiowa Nation of Oklahoma. She married David Andrew Martinez on Sept. 18, 1993, in Lawrence. He survives of the home. Other survivors include a son, Mason Zane Martinez, and two daughters, Madison EnDreya Martinez and Jordan Elizabeth Martinez, all of the home; a brother, Thomas Ogle, Topeka; and a sister, Ann Ogle-David, Yukon, Okla.
She was preceded in death by her parents, five brothers, David Ogle, Roger Ogle, James Ogle, Daniel Ogle and William Ogle, and two sisters, Ramona Ogle Hadl and Rosemary Schwaninger. The family will meet friends from 5 p.m. to 7 p.m. Monday at Lawrence Chapel Oaks funeral home. A rosary will be prayed at 7 p.m., after which the family will again meet friends until 8:30 p.m. A prayer service will begin at 8:30 p.m., followed by a family gathering until 10:30 p.m. The family suggests memorials to the Theresa Martinez Children’s Trust Fund, sent in care of Douglas County Bank, P.O. Box 429, Lawrence, KS 66044 or in care of Lawrence Chapel Oaks, 3821 W. Sixth St., Lawrence, KS 66049.